In any event, it’s a great market. Much smaller and more intimate than La Boqueria, but with a great variety of top quality produce, meats and seafood. I didn’t price compare but my instincts are merchandise is significantly less here than at La Boqueria. A few items of note about our visit to this market. I was surprised at how much salted fish was for sale, given that this community is in close proximity to the ocean with plentiful access to fresh fish. I found out later that this was because salted fish are a traditional food — dating to the days when fishing fleets lacked refrigeration and freezers. The fish are salted to preserve them, then soaked in water by the consumer to remove the salt and used in soups and similar dishes. Also, I was amazed at the huge selection of olives available – dozens of varieties. Several of the olive vendors sold a small “kabob” that contained several types of olives, usually with some fish and pickled vegetables. You’d put the small kabob in your mouth and strip off all the contents and then chew and enjoy — they were uniformly delicious! Costing about 1 Euro, we started to look for these during our travels around Spain. 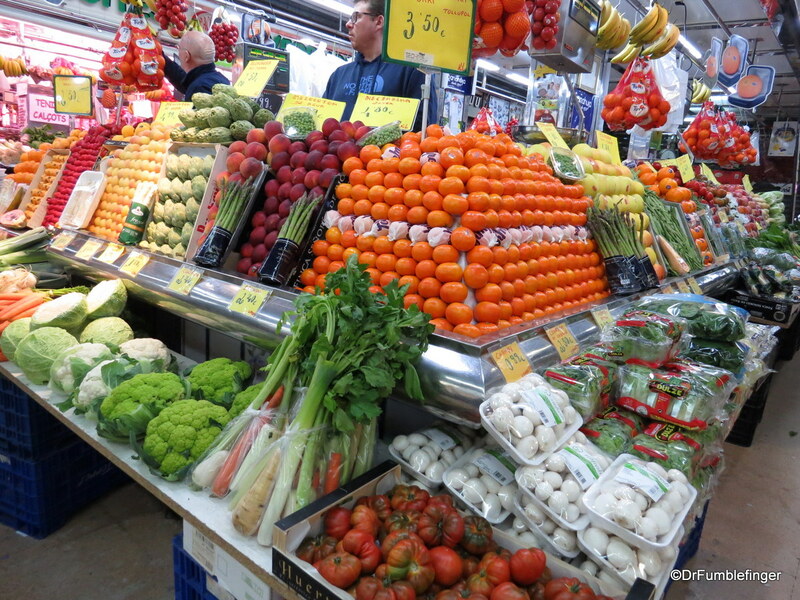 Here then is some of what we discovered at this market in Gracia.